New Jersey has some of the highest taxes in the U.S., along with pricey homes in much of the Garden State. The nation’s most densely populated state has a lot to offer, though, and we don’t just mean proximity to New York City. Ready to take a detailed look at the cost of living in New Jersey? You’ve come to the right place. New Jersey is home to two of America’s 10 wealthiest counties, Hunterdon County and Somerset County. As you might imagine, homes in these counties are expensive. But they’re not the only New Jersey spots with high home prices. According to trulia.com, Middlesex County, NJ has an average listing price of $1,395,000. The runner-up is Bergen County in northern New Jersey, with an average listing price of $591,296. Every county in the Garden State has average listing prices in the six figures. The lowest prices are in Cumberland County, at $125,872. 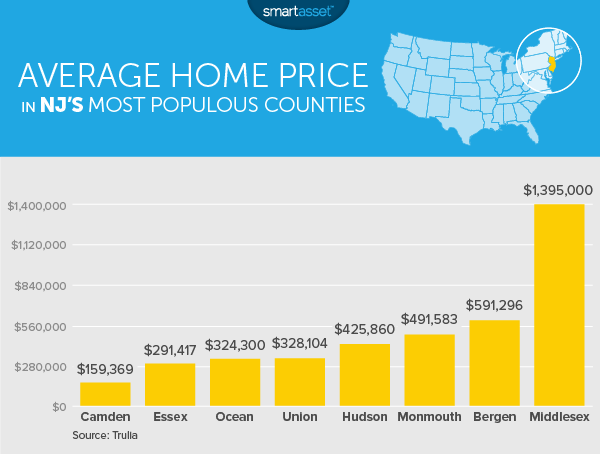 Check out the chart below to see how massive the spread is between NJ counties’ home prices. The high home prices in the Garden State may mean you need a mortgage to finance your home. Take a look at our New Jersey mortgage calculator to see what your monthly payments may be. New Jersey rents are well above average. A studio apartment in New Jersey goes for an average of $1,408 per month, according to myapartmentmap.com. That’s $353 above the national average. A one-bedroom in New Jersey rents for an average of $1,366, $365 more expensive than the U.S. average. If you want to rent a place with two bedrooms, brace yourself. The New Jersey average rent is $1,757. That’s $526 over the national average. Three-bedroom apartments in the Garden State go for a whopping $2,238 per month, a full $705 above the U.S. average. While housing costs are high whether you rent or buy, there is some good financial news in the Garden State. The average monthly utility bill in New Jersey is $105.65, according to the U.S. Energy Information Administration. That’s about 7% below the U.S. average of $114.09. Prices can be higher in big cities, though. According to numbeo.com, the average monthly utility bill for a 915-square-foot apartment in Newark, NJ is $169.50. In Trenton, it’s $146.39 and in Jersey City it’s $125.83. Want to stock your home or apartment with groceries in New Jersey? Expect to pay above-average prices. Compared to a national average indexed to 100, groceries in New Jersey come in at 107. Another study found that New Jersey’s grocery prices were the eighth-highest in the nation. Many of New Jersey’s residents commute by public transportation. In fact, after New York City, the U.S. city with the highest proportion of public transportation users is Jersey City, NJ. Also in the top 10 is Newark, NJ. According to the Census Bureau, the average commute time in New Jersey is 30.4 minutes. That’s 19% longer than the average commute in the U.S.
How much do New Jersey residents who don’t take public transit spend on gas? According to gasbuddy.com, the average price of a gallon of gas in the Garden State is $1.725. That’s almost 7% below the national average. New Jersey taxes are among the highest in the nation. The top tax rate in New Jersey’s progressive state tax system is 8.97%. That may sound high, but it’s still lower than the top income tax rates in California, Hawaii, Oregon, Minnesota and Iowa. 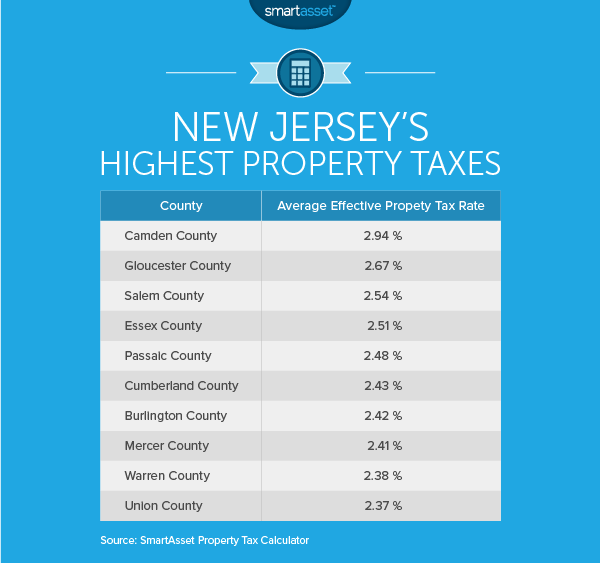 Property taxes in the Garden State are the highest in the nation, however, with an average effective property tax rate of 2.19%. Check out the chart below to see the average effective property tax rate in the 10 counties with the steepest property taxes. Check out the top financial advisor firms in New Jersey if you’re in need of professional tax management and financial planning services. New Jersey is home to Princeton University, which consistently ranks as America’s best college or university. Princeton also ranked as America’s best college town in a SmartAsset study. For a college with a lower price tag than Princeton, New Jersey residents have lots of options. In-state tuition and fees at Rutgers (ranked #72 by US News and World Report) total just $14,131 . Now that the Affordable Care Act requires everyone to have health insurance, those without employer-sponsored coverage may want to choose their state of residency carefully. The second-lowest-price Silver plan in the Health Insurance Marketplace in Newark, New Jersey goes for $330 (for 2016 coverage). That’s up 4% from the previous year. For a detailed look at all the healthcare options in the Garden State head here. Many of New Jersey’s attractions are free. 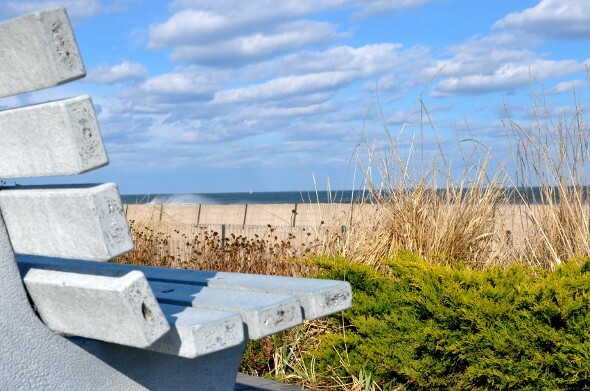 It won’t cost you a thing to stroll along the Atlantic City boardwalk, admire the Victorian houses of Cape May or check out the Princeton University campus (and the excellent free art museum there). Ready to splash out? You can visit the Liberty Science Center for $21.75 or the Grounds for Sculpture art park for $15. If you are moving to New Jersey, it’s a good idea to understand how the change in cost of living will impact your budget. A financial advisor can help you navigate big life changes like a move, or just identifying and meeting your financial goals in general. A matching tool like SmartAsset’s can help you find a person to work with to meet your needs. First you answer a series of questions about your situation and your goals. Then the program narrows down thousands of advisors to three fiduciaries who meet your needs. You can then read their profiles to learn more about them, interview them on the phone or in person and choose who to work with in the future. This allows you to find a good fit while doing much of the hard work for you.